This example shows the design of a LTE MIB recovery system optimized for HDL code generation and hardware implementation. The design is optimized for HDL code generation and the architecture is extensible, allowing additional processing stages to be added, such as indexing and decoding for the PCFICH, PDCCH and PDSCH (see LTE HDL SIB1 Recovery). LTE signal detection, timing and frequency synchronization, and OFDM demodulation are performed on the received data. This produces the grid data and provides information on the subframe number and cell ID of the received waveform. The MIB message is always carried in subframe 0, and the cellID is used to determine the location of the cell-specific reference signals (CRS) for channel estimation, as well as being used to initialize the descrambling sequence for PBCH Decoder. As the MIB message is always carried in subframe 0 of the downlink signal, subframe 0 is buffered in a memory bank. Once the subframe has been written to the memory bank the location of the CRS is calculated using the cellID. The CRS are read from the grid memory, and are sent to the channel estimator. The CRS from the received grid are then compared to the expected values, and the phase offset calculated. The channel estimates for each CRS are averaged across time, and linear interpolation is used to estimate the channel for subcarriers which do not contain CRS. The channel estimate for the subframe is used to equalize data when it is read from the grid memory. The PBCH is always allocated to the central 6 Resource Blocks (RBs) of subframe 0, within the first 4 OFDM symbols of the 2nd slot. It occupies all of the Resource Elements (REs) within this region, excluding the locations allocated to CRS. The locations of the CRS are calculated using the cellID, then the addresses of the REs occupied by the PBCH can be calculated (240 locations in total), and the data retrieved from the grid memory bank. As the PBCH data is read from the grid memory bank it is equalized using the channel estimate. The 240 equalized PBCH symbols are buffered, and PBCH and BCH decoding are attempted for each of the 4 possible versions of the MIB within a PBCH transport block. Each of these versions requires a different descrambling sequence, so descrambling, demodulation, rate recovery, convolutional decoding, and CRC check must be attempted for each. If successfully decoded, the CRC value gives the cellRefP value - the number of transmit antennas, and the MIB bits can be parsed to give the system parameters. The architecture of the LTE HDL Cell Search and MIB Recovery implementation is shown in the diagram below. The input to the receiver is baseband I/Q data, sampled at @ 30.72 Msps. A 2048-point FFT is used for OFDM demodulation, and is sufficient to decode all of the supported LTE bandwidths. The resource grid buffer is capable of storing one subframe of LTE data. Once the receiver has synchronized to a cell, data from the OFDM demodulator is written into the grid buffer. The PBCH indexing block then generates the indices of the resource elements which carry the PBCH. Those resource elements are read out of the grid buffer and equalized, before being passed through the PBCH decoder. This architecture is designed to be extensible and scalable so that additional channel indexing and decoding functions can be inserted as needed. For example it can be extended to perform SIB1 recovery as shown in the LTE HDL SIB1 Recovery example. The top level of the ltehdlMIBRecovery model is shown below. HDL code can be generated for the HDL LTE MIB Recovery subsystem. The ltehdlMIBRecovery_init.m script is executed automatically by the model's InitFcn callback. This script generates the dataIn and startIn stimulus signals as well as any of the constants needed to initialize the model. Input data can be loaded from a file which, for this example, is LTE Receiver Using Analog Devices AD9361/AD9364 (Communications Toolbox Support Package for Xilinx Zynq-Based Radio). Alternatively, an LTE waveform can be synthesized using LTE Toolbox functions. To select an input source, change the loadfromfile parameter in ltehdlMIBRecovery_init.m. The structure of the HDL LTE MIB Recovery subsystem is shown below. The Downlink Sync Demod block performs frequency and time synchronization, PSS/SSS signal detection, and OFDM demodulation. The MIB Decoder subsystem buffers subframe 0 of the incoming data, performs channel estimation, and attempts to decode the PBCH to recover the MIB information. The operation of the ltehdlDownlinkSyncDemod is described in more detail in the LTE HDL Cell Search example. The cellDetected input is asserted, preparing the subsystem to receive and process data. OFDM data is streamed into the MIB Decoder subsystem, and subframe 0 is stored in the Resource Grid Memory. The PBCH Indexing block starts generating PBCH resource element indices. Those resource elements are then read out of the Resource Grid Memory and equalized by the Channel Equalization block. Finally the equalized PBCH data is passed through the PBCH Decoder block and the MIB is extracted. The Resource Grid Memory block contains a memory bank, a write controller, and a read controller. The memory bank capacity is one subframe of demodulated OFDM data at the largest supported LTE bandwidth (20MHz). The memory write controller is responsible for writing subframes of data to the memory bank. The writeSubframe input enables the write controller for the appropriate subframes; subframe 0 in the case of the present example. The LTE Memory Bank contains RAM of dimensions 14 x 2048 x 16 bit complex values; that is 14 ODFM symbols, each containing 2048 complex values. The MemoryBank Write Controller startChest output is used to start the channel estimation process once the last reference symbol for the current subframe has been written to the memory bank. The refSymbol Read Controller calculates the indices required to read cell reference symbols from the grid, which is equivalent to the LTE Toolbox function lteCellRSIndices. The memory bank always outputs the data from all 14 OFDM symbols. However not all of this data is needed for the channel estimation or for the PBCH decode. The refSymbolSelect and gridBankSelect subsystems select the appropriate OFDM symbols for channel estimation (reference symbols) and data respectively. The PBCH Indexing block computes the memory addresses required to retrieve the PBCH from the grid memory buffer. This is equivalent to the LTE Toolbox ltePBCHIndices function. The data retrieved from the grid memory is then equalized and passed to the PBCH Decoder for processing. The PBCH Indexing subsystem becomes active after the channel estimate for subframe 0 is ready, as indicated by the hestRdy output of the Channel Equalization subsystem. The PBCH is always 240 symbols in length, centred in the middile subcarriers, in the first 4 symbols within the 2nd slot of subframe 0. The Channel Equalization block contains three subsystems. cellRefGen generates the cell-specific reference signal (CRS) symbols using a Gold Sequence generator. chEst performs channel estimation using a simple, hardware-friendly channel estimation algorithm. Equalization performs phase correction by multiplying grid data with the complex conjugate of the appropriate channel estimate value. The channel estimator generates a single complex-valued channel estimate for each subcarrier of the subframe using the following algorithm. Estimate the channel at each CRS resource element by dividing the received value by the transmitted symbol (generated by cellRefGen). Average these channel estimates across time (for the duration of the subframe) to generate a single complex-valued channel estimate for each subcarrier that contains CRS symbols. Use linear interpolation to estimate the channel for subcarriers which do not contain CRS symbols. The input to the chEst subsystem is a vector of 4 QPSK symbols, corresponding to OFDM symbols 0, 4, 7 and 11 of the subframe. This allows chEst to extract the CRS resource elements and estimate the channel as described above. The channel estimate is calculated using data from a single transmit antenna. As a result there is no transmit diversity decoding performed for cases where the transmitter uses 2 or 4 transmit antennas, which may result in a performance penalty. The simple time average algorithm used for the channel estimation assumes low channel mobility. Therefore, the channel estimate may not be of sufficient quality to decode waveforms that were transmitted through fast fading channels. Once the channel estimate is calculated it is used to equalize the gridData as it is read out from the Resource Grid Memory. The PBCH Decoder performs QPSK demodulation, descrambling, rate recovery, and BCH decoding. It then extracts the MIB output parameters using the MIB Interpretation function block. 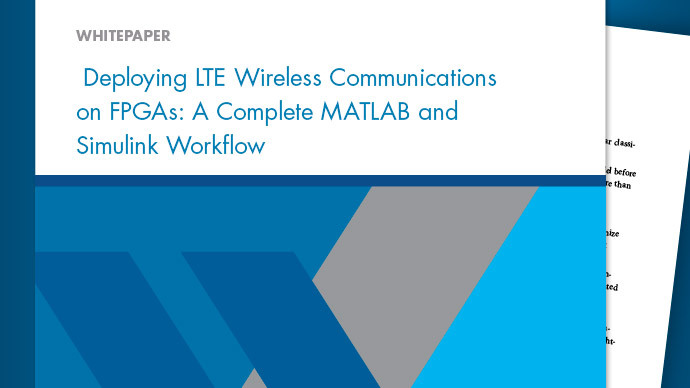 These operations are equivalent to the ltePBCHDecode and lteMIB functions in the LTE Toolbox. The PBCH Controller stores the equalized data in memory for iterative convolutional decoding attempts. The 4 attempts made at decoding the MIB correspond to the 4 repetitions of the MIB data per PBCH transport block. The BCH Decoder quantizes the soft decisions and then decodes the data using the LTE Convolutional Decoder and LTE CRC Decoder blocks. The recommended wordlength of soft decisions at the input to the convolutional decoder is 4 bits. However, the BCH Decoder block receives 20-bit soft decisions as input. Therefore the softBitScalingUnit block dynamically scales the data so that it utilizes the full dynamic range of the 4 bit soft decisions. The CRC decoder block is configured to return the full checksum mismatch value. The CRC mask, once checked against the allowed values, provides cellRefP; the number of cell-specific reference signal antenna ports at the transmitter. If the CRC checksum does not match one of the accepted values then MIB has not been successfully decoded and the PBCH Controller decides whether or not to initiate another decoding attempt. When a MIB has been successfully decoded, the MIB Interpretation subsystem extracts and outputs the fields of the message. There are two cells in the captured waveform, one with cell ID 76 and one with cell ID 160. The cell with NCellID = 76 has a much higher ReportedRSRQ, indicating that it is a stronger signal. In this example the Simulink model decodes the MIB for NCellID = 76. The scope below shows the key control signals for this example. After a pulse is asserted on the start signal the cell search process is started. Successful detection of a cell is indicated by the cellDetected signal. When the cellDetected signal is asserted the NCellID and TDDMode signal become active, indicating the cell ID number and whether the cell is using TDD (1) or FDD (0). After the cell has been detected the OFDM demodulator waits until subframe 0 of the next frame to start outputting the grid data, hence there is a gap between cellDetected going high, and grid data being output as indicated by the gridDataValid signal. When gridDataValid is first asserted subFrameNum will be zero, and will increment for subsequent subframes. The simulation stops on the MIBDetected or mibError signals being asserted. Once MIB has been detected the NDLRB, PHICH, Ng, nFrame, and CellRefP signals all become active, indicating the key parameters of the cell. These parameters are displayed in the model, as they are static values when the simulation is stopped. This indicates that the duplex mode used by the cell is FDD, the MIB was decoded in frame number 262, the PHICH duration is 'Normal' and the HICH group multiplier value is 'One'. To generate the HDL code for this example you must have an HDL Coder™ license. Use the makehdl and makehdltb commands to generate HDL code and HDL testbench for the HDL LTE MIB Recovery subsystem. Because the input waveform in this example contains at least 40 subframes to complete the cell search and MIB recovery, test bench generation takes a long time. This example is configured to use System Verilog DPI test bench to speed up the test bench generation. The HDL LTE MIB Recovery subsystem was synthesized on a Xilinx® Zynq®-7000 ZC706 evaluation board. The post place and route resource utilization results are shown in the table below. The design met timing with a clock frequency of 140 MHz. For more information see Prototype LTE Algorithms on Hardware. 1. 3GPP TS 36.214 "Physical layer"